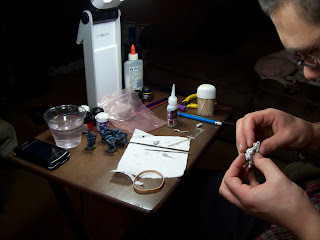 I'm happy to say that I've been hired to paint some models for Baelor miniatures (http://www.baelor.com/). 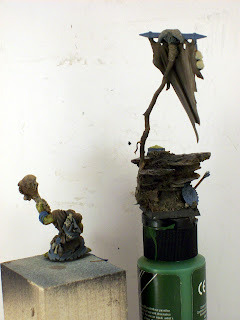 I exchanged a few E-mails with Clint and he sent me two models he sculpted. 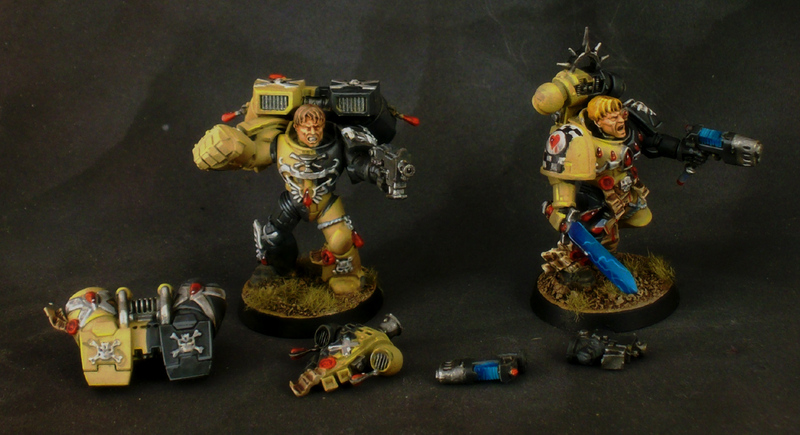 A Vulkan and a Reaver. Both are nice models. I've already started painting the Reaver and I have to appreciate the attention to detail. Clint has a unique style. I'd compare some of his pieces to John Blanche artwork. The picture above is of the Reaver. 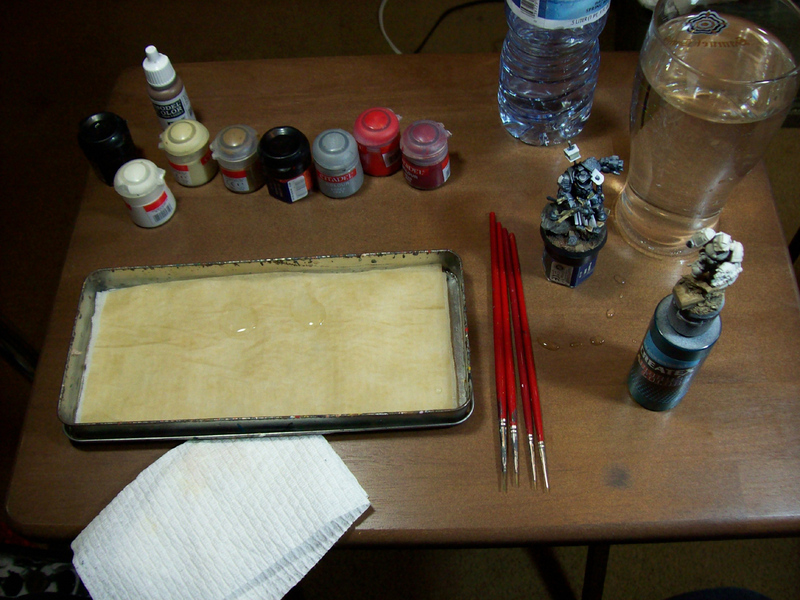 Here's a little step by step of how I created the base. It starts with a foundation of filler material. 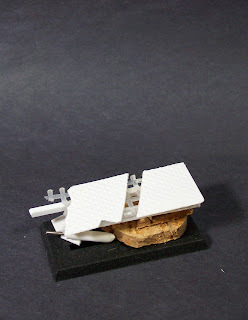 Cork is very useful for this. Next I started building a small catwalk to attach to the top. Just some plasticard and weaving material. Once the catwalk was attached it was ready for some dried soil. And of course the centerpiece. The model itself. 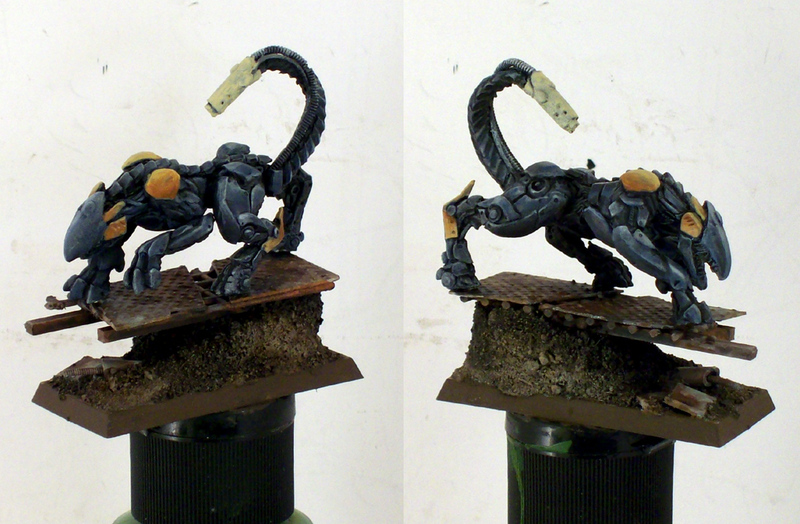 The idea with the base was to add to the prowling nature of the model. It couldn't be too elevated for practical purposes but the negative space below gives it sense of height. Now I had it assembled and with Brother John keeping me company I began to paint. 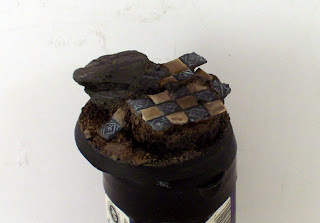 This is just the foundation layer composed of wet blending and quick highlights. I'll go over it 2 more times before it's done, every time using the transparencies of the paint to build upon the previous layer. 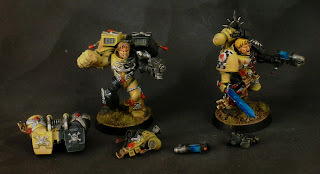 Brother John has some time off work due to the holiday and we got together to get some painting done. 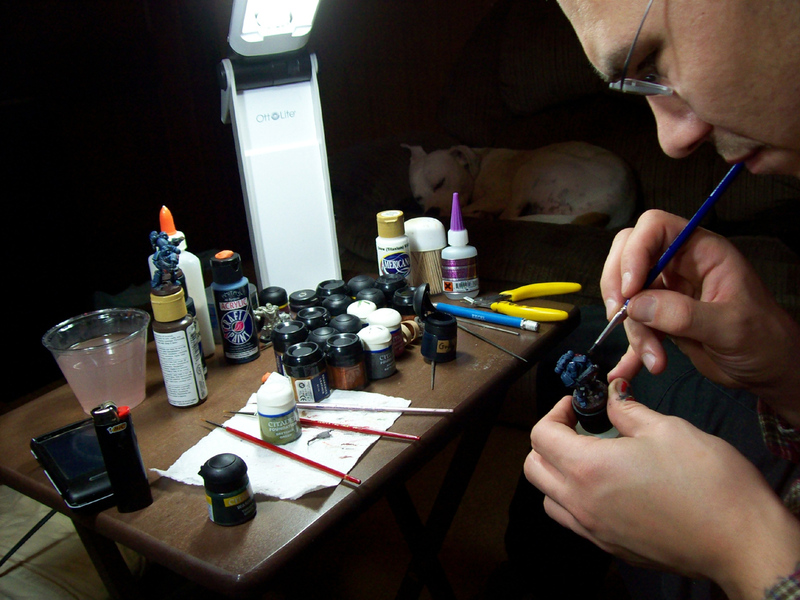 I set up with some colors I'd be using to finish off some E-bay pieces while brother John carefully selected which figures would get the paint. 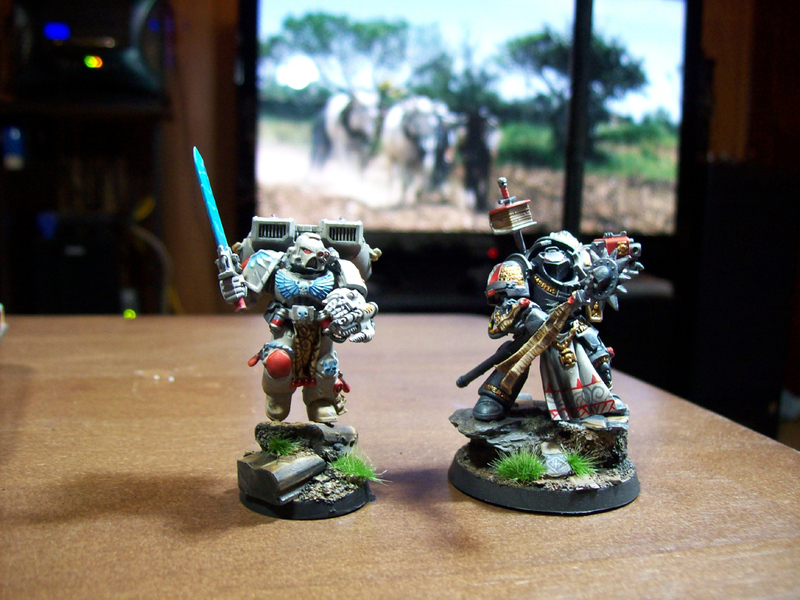 He also had some Gamezone knights to prep. With flannels and entertainment all set, we got to work. I'll have some nice photos of these two up before Sunday night. 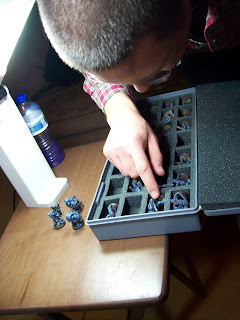 I also started prepping some miniatures I've received from Baelor (http://www.baelor.com/)but more on that tomorrow. As promised I'm starting to dig through all the photos I took of the completed Christmas projects. This one was for my Dad. I hope you have all enjoyed the company of your loved ones. 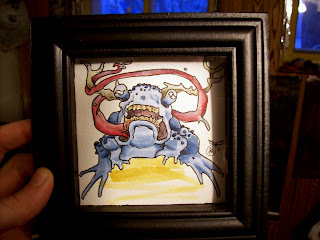 I did and it was a very special feeling to present the miniatures I had painted for my family. I'll have separate collages of all the miniatures in the future but for now enjoy this family photo. This was also presented as a gift to my girlfriend. "God bless us, every one of us"
More Christmas minis on the way. This one is for my Dad. I'm about four hours in on this one. He has much more work to be done but it's a decent start. You never expect the setbacks when they come. Here's one of my Christmas gifts all wrapped in pigments and spices. 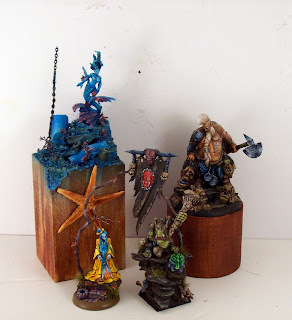 I've also made much progress on the other mini's. 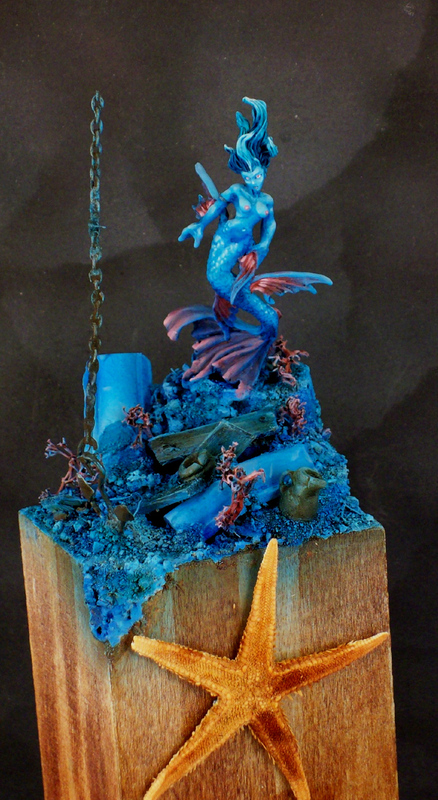 Here's the mermaid I plan on giving to my sister. The first shot is off the model just after it was airbrushed. 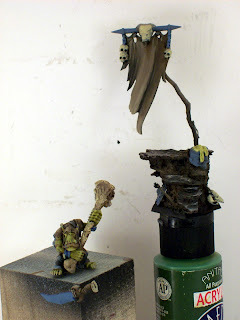 and here with some brushwork. One more sit-down with her and some touches here and there and viola. Here's where I left off on our portly friend yesterday at 1:30 in the morning. You may notice I've changed the color of his hair. 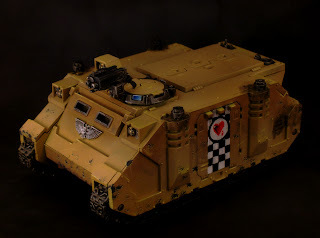 After examining the model I realized that I could cut the red out of the equation and the paintjob would look much more unified. There is a compositional value to keeping your color choices low. You can see the original hair color in my last post. I'm happy to say he should be complete by the end of tonight. The next project on the slate is a lovely mermaid for my sister. 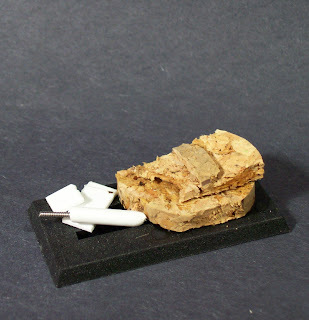 I still have some modelling to do on the pottery and I'd like to add an anchor touching down on the front corner. 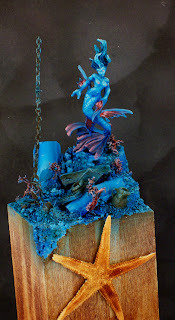 My plan for the overall color scheme is of course aquamarine colors but with pink accents like the coral and parts of the figure. More on her later, Cheers! Here's where I left off after last nights painting session. I'm hoping after tonight He'll be ready for some finishing touches. 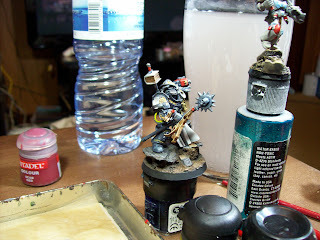 The idea with the metals is to paint a good base of the second brightest color I'm using and then glaze in successive shadows much like the technique Scibor uses on their figures. I used that technique on his skin and it's looking pretty good so far, not finished but close enough to paint in the rest of the model. 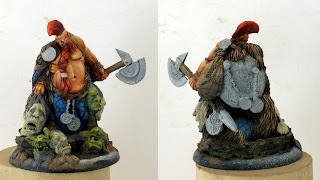 I should mention he's a 54mm model but a dwarf so he ends up being about an inch and a half from his base to the tip of the mohawk. 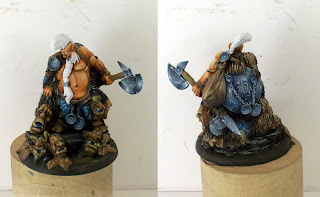 Neat, here's a link to Scibor's version (http://sciborminiatures.com/en_,shop.php?art=628#i/54mm/big/sigurt_the_slash_01.jpg) After he's complete I plan on adding some tattoos covering the left half of his body. Kind of like these. 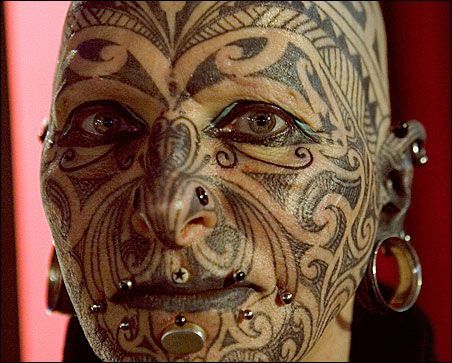 Hmm looks like they went for the tattoos as well. While I was working on the Dwarf I was simultaneously prepping some E-bay sales. I'm drumming up another Grey Knight Librarian and a Sanguinary Priest. I doubt I'll be able to finish them very soon but every bit helps. Here's the base for the Librarian, I had fun on the last one with small freehand designs and this time I added the pattern to a tile floor base. The Figure itself is coming along. 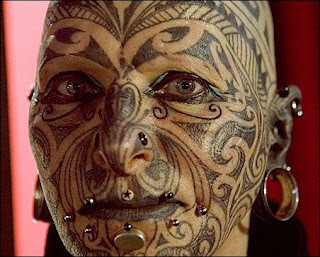 He's a bit of an experiment. 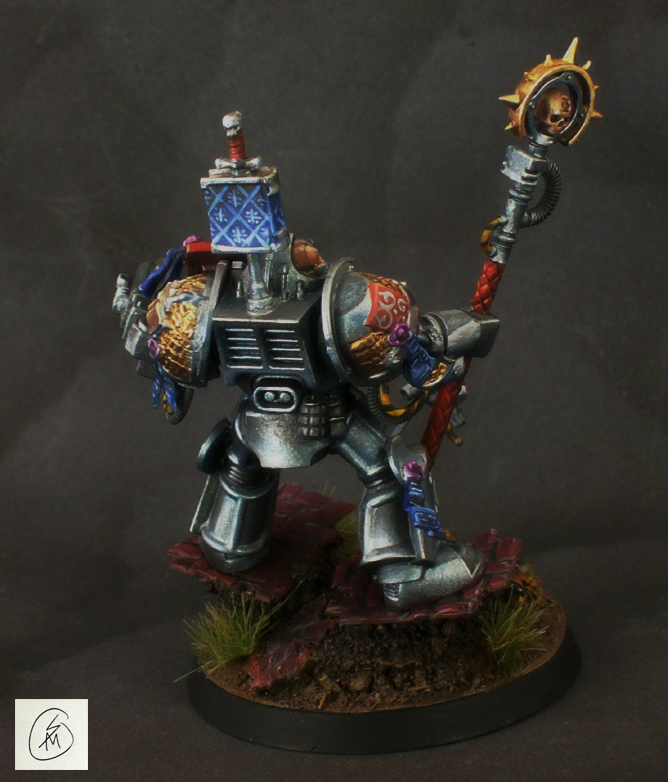 With the last knight I painted I based the shadows on a blue tint. This time I wanted to see what a purple tint would look like. 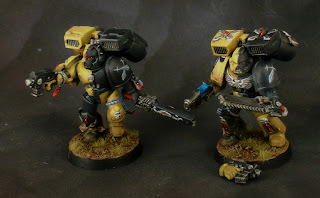 Purple and Gold looks good on a wind suit so why not on some tactical dreadnought armor? He looks a little goofy right now but I'm going to see him through. I think the dark purple will contrast nicely once the other elements of his armor are painted in with warm and bright colors. 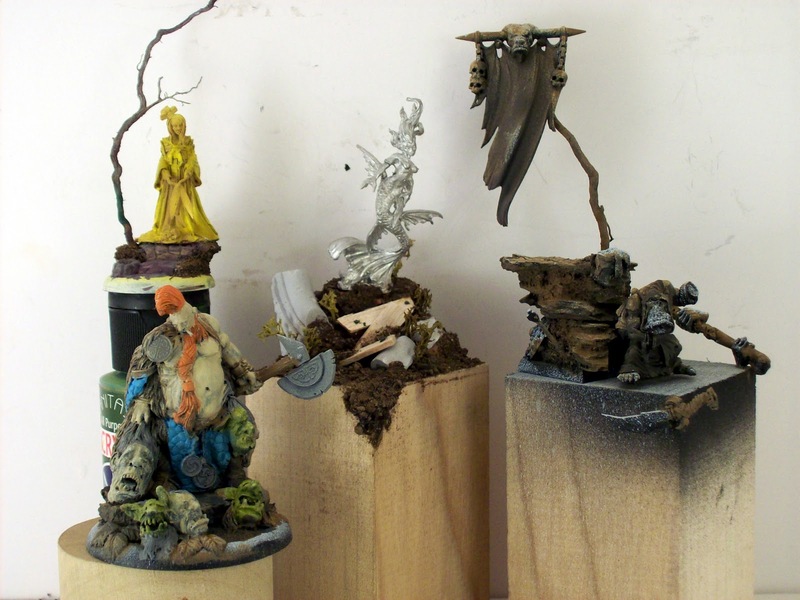 Well back to my night with a dwarf, mermaid, orc shaman, and a geisha girl. What do these models all have in common? More as they come along. 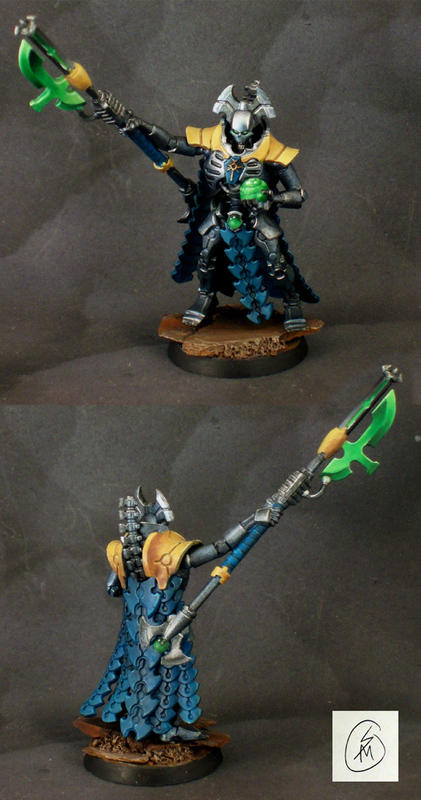 Here are the Necrons I finished off earlier this week. They're safely on their way to Switzerland at the moment. 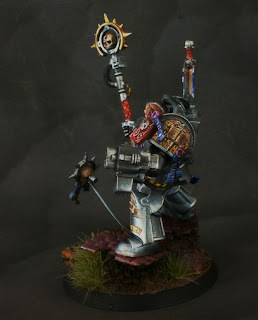 It was very fun working with the true metallics but man they are hard to photograph. I was lucky to get a decent cast on try number 2. 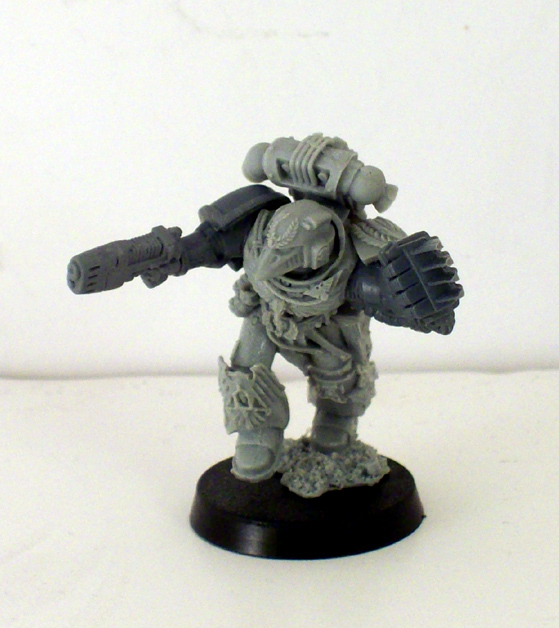 I should add that Gw replaced the parts I needed in good time. The Command Barge was a different story and went together very well. 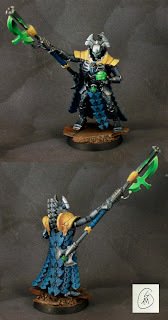 I really like the look of this model with the Necron lord riding high. 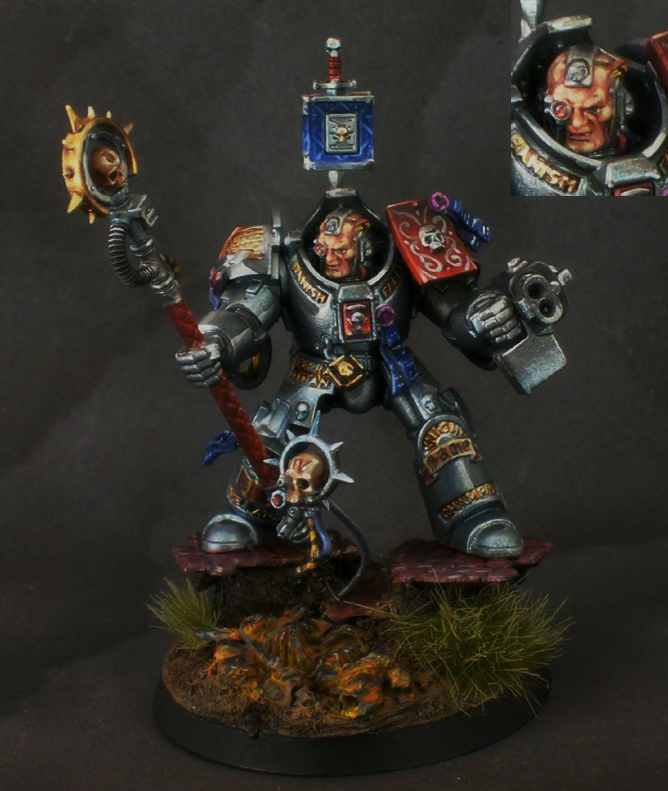 Since this was a Christmas gift for a younger and newbie to the hobby I thought I should make the Lord removable and with a separate base. Hopefully the little guy gets more mileage out of his gift this way. 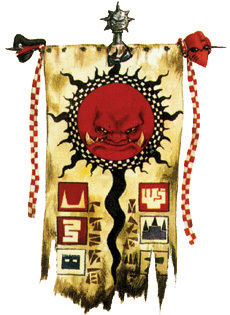 I was also asked to list a way to recreate a similar scheme for the rest of the army. 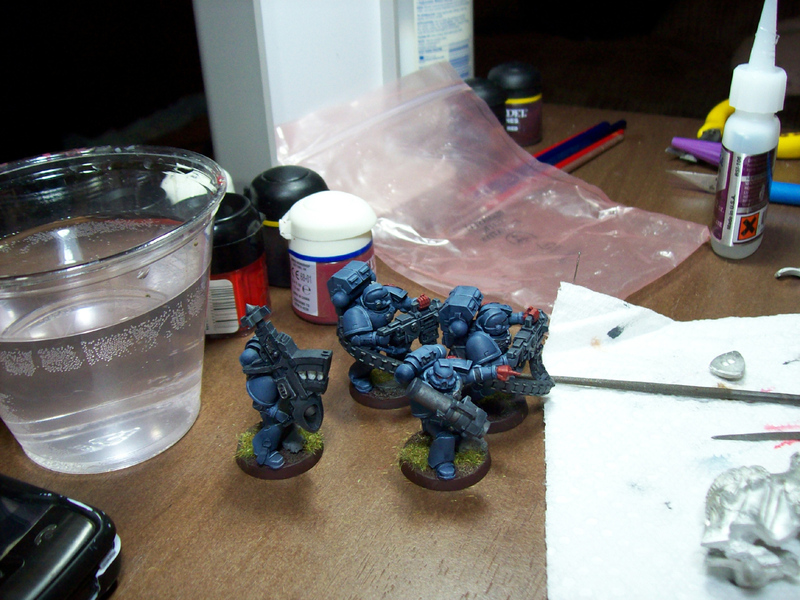 Metals- Vallejo oily steel basecoat followed by and wash of badab black then a thinned down wash of asurmen blue. Highlight with mithril silver. 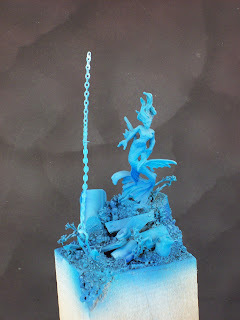 Turqoise- Hawk turquoise wash with asurmen blue. Highlight with a 50/50 mix of skull white and hawk turquoise. 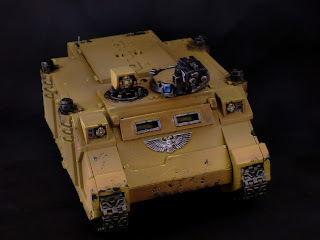 Yellow- Iyanden darksun washed with devlan mud. Highlight with bleached bone. 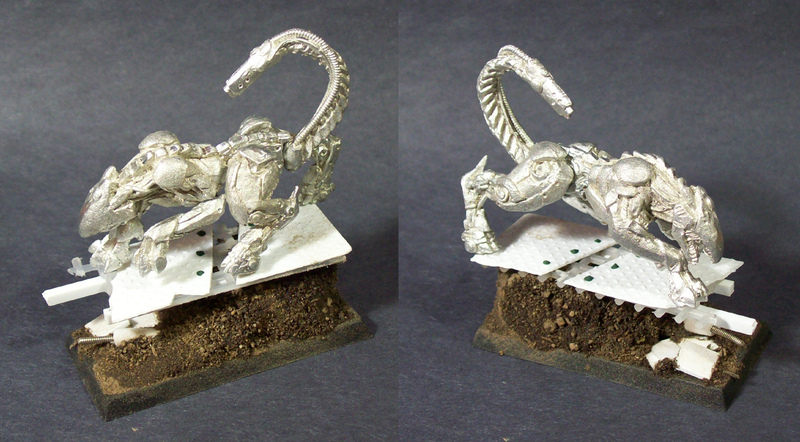 Green- scorpion green washed with thraka green. Highlight with scorpion green then a second highlight with a 50/50 mix of scorpion green and sunburst yellow. Base- Bestial brown drybrushed with graveyard earth then a drybrush of bleached bone. Wash with devlan mud. That should do it :) Good luck on the rest of the army Christophe! Good fun with True metallic metals. It was a challenge to control the metallic paints in the same way you can non metallics. 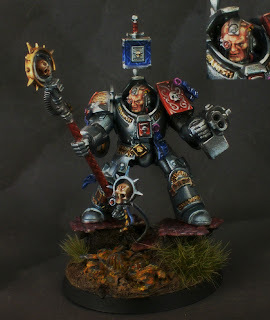 Then Photograph them, I see why many pro's use Non Metallic techniques. Yesterday was a great day for painting, I finished off all the Nercon commissions and the Knight up top. I was still motivated though so I got an early start on this weeks objectives. My plan for the week is this, finish Ezekiel here, a Ravenguard Captain, begin my Dad's Christmas mini, and start up a big big project starting from the ground up. 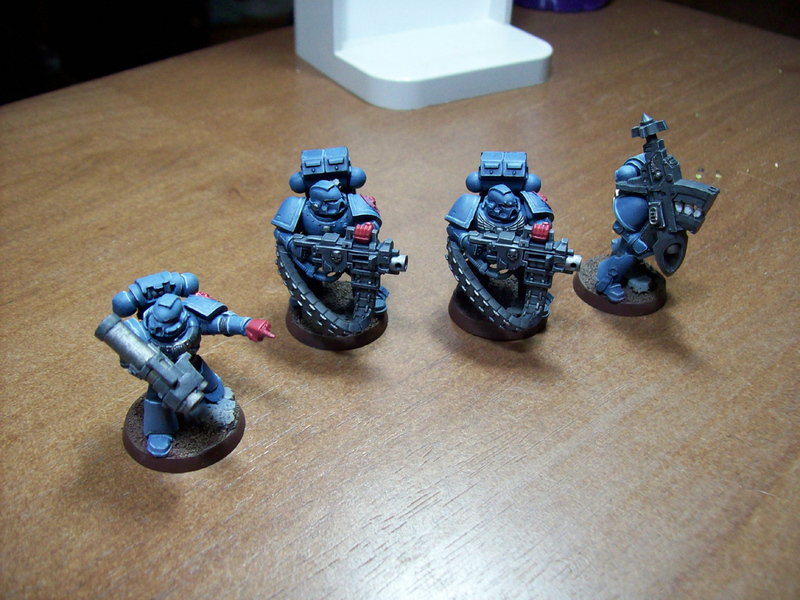 I almost forgot, I have some tabletop quality space wolf terminators to rock out as well. There's also this week's personal project Friday which is a day I'm growing to love more and more. 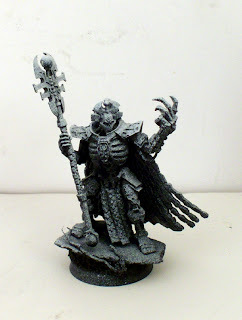 Here's that Ravenguard Captain as he was sent to me. Oh precious resin, save us from finecast. 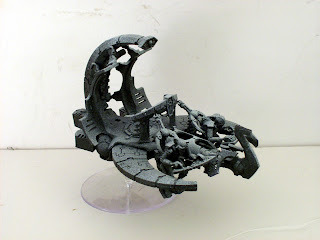 My next goal is to paint a small Necron Commission composed of Imotek the Stormlord and a Command Barge. 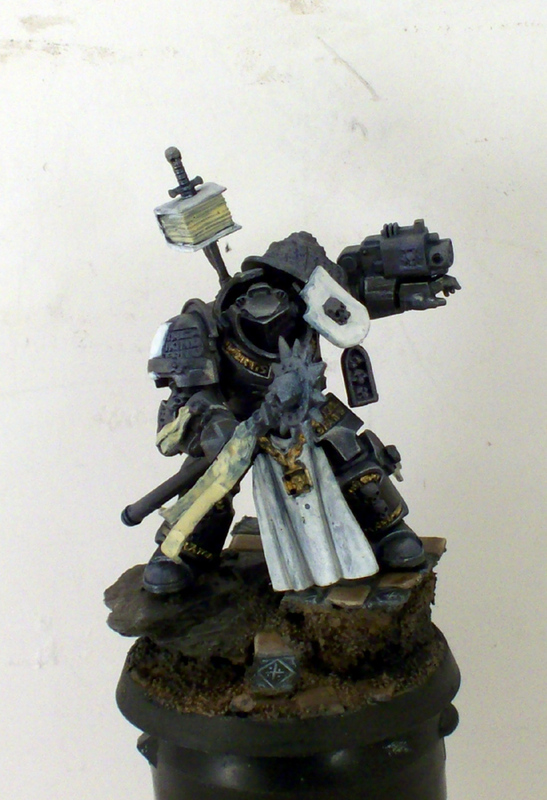 Since I'll be working with all that silver I also Put together a Grey Knight Librarian. 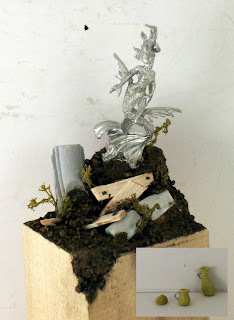 This model was very fun to build, I just went to it and this is what came out. I like the way the servo skull is filling the negative space. in front of the model. Part of the commission was to model and paint 10 assault marines from a death company box and an assault squad box. 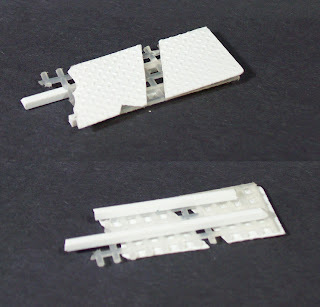 All of these have magnetized backpacks so they can be either footslogging or jump packing. I also had to make 2 seargeants with a load of options. I also painted up a rhino for them. Not sure why the pics came out so different. The other part was painting up 10 reeeeally old assault marines.